Jessica Simpson Solid Black Pantent Faux Leather Classic Pumps Women’s 6 Overall good used condition. Shows normal signs of wear. Please see pictures for details. Heel height 5" Platform 1" Scuffs throughout. Comes in original box. Please ask all questions before buying. Style Type: Platform Open toe. JESSICA SIMPSON Women's Colavita US6M Black Leather Look Cork Platform Wedges. New without box. Never worn. No scuffs, rips or stains. Very soft uppers. Heel Type - Stiletto. (Shoe Upper indicates Fabric. Heel Height - Approx. Color - Black. ). JESSICA SIMPSON Black Patent Leather Stiletto High Heel Open Peep Toe shoes SIze 6B Great conditions, like new Please see all pictures Thank you for looking! JESSICA SIMPSON 'CARRI' PLATFORM PUMPS WOMEN'S SIZE 6 MEDIUM PATENT LEATHER BLACK FEATURES: *Very good condition *Minimal signs of wear *Clean interior-exterior *95% of tread life left with even wear *Rubber soles *Slightly cushioned footbed *5" heel ***If you have any questions, please contact us at any time and remember that we will entertain all offers, so don't hesitate to make one. Thank you! Toe Style: Peep Toe. Dress & Formal. Strap Type: Ankle Strap. Fashion Sneakers. Closure Type: Buckle. Heel Height: 5. Heel Type: Stiletto. Material: Leather. Colors include brown, black, and cork. BEAUTIFUL SHOES. Perfect for Fall. Can be worn to any occasion. Dress up or down. Labeled size 6B. Gently used item. Shows signs of wear. NEW WITHOUT BOX, JESSICA SIMPSON PEEP TOE WEDGE ESPADRILLE HEELS GALIX STYLE SIZE 6 BROWN LEATHER UPPERS, WOVEN WEDGE SHOES WERE USED ON DISPLAY AND SHOW MINOR SIGNS OF HANDLING AS A RESULT PLEASE REVIEW ALL PICTURES AND FEEL FREE TO ASK ANY QUESTIONS!! Model: Lonni. 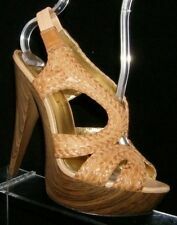 Type: Strappy Cork Platform Wedges.